This collection contains six hundred and six American and British-made rewards of merit dating between 1802 and 1900. Present are examples of early printing techniques used in Boston, New York, Newburyport, Lowell, and Providence; including chrome plating, lithography, embossing, chromolithography, lacework and woodblock printing. There are also merits handmade by teachers, such as the cut paper prize given to Miss Mary Dodge in 1826. In folder eleven, there is relevant correspondence sent between William Sumner Appleton and donors who contributed rewards of merit to Historic New England during the 1920-40s; the decades when the materials were accumulated most rapidly. We also possess numerous micro-collections; groups of rewards of merit given to a single pupil over a span of time, generally by one teacher. An electronic finding aid is available through Historic New England's Collections Access Portal. A paper finding aid is available in the Library & Archives. The materials were collected privately by individuals across New England and the United States, and later acquired piecemeal by Historic New England. The majority of the collection arrived at Historic New England by mail in the decade following the 1925 publication of Hattie Elliot Johnson's article Old Time Rewards of Merit in Old Time New England, which prompted public interest and donations. By this process Historic New England's collection of Rewards of Merit was formed, excepting occasional purchases by Appleton and others. A collection of nineteenth century rewards of merit. In 2016 materials were removed from acidic folders and where necessary inserted into protective Mylar sheets. Delicate materials may be restricted due to their condition. There are no technical restrictions on this collection. Acidic envelopes original to the 1920s were photocopied and discarded in 2016. Item identification. Box #, folder #. Rewards of Merit. Ephemera collection (EP001). Historic New England, Library & Archives. This collection was processed by Kirsten Vega, 2016. This finding aid is DACS-compliant. Johnson, H. E. (1925). Old Time Rewards of Merit. Old Time New England, 16(1), 41st ser., 11-17. Condon, L. (2012, Summer). History on Paper. Historic New England, 29. The reward of merit is a small piece of paper given to school children for good behavior. Usually it features a pleasant image; whether decorated by hand, with watercolors, or chromolithography. The cards were used to commend regular attendance, exemplary deportment, studiousness and more. The practice of giving motivational rewards of merit to school children originated in America at the turn of the nineteenth century, and was practiced into the early twentieth; the decades which saw printer matter come into ubiquity. Early on, teachers would hand-decorate tokens, sometimes awarding samples of their own calligraphy, but by the 1850s it had become more usual to purchase sheets of pre-fabricated rewards from local stationers. These had dotted lines for names and dates and almost always carried the headline Reward of Merit. 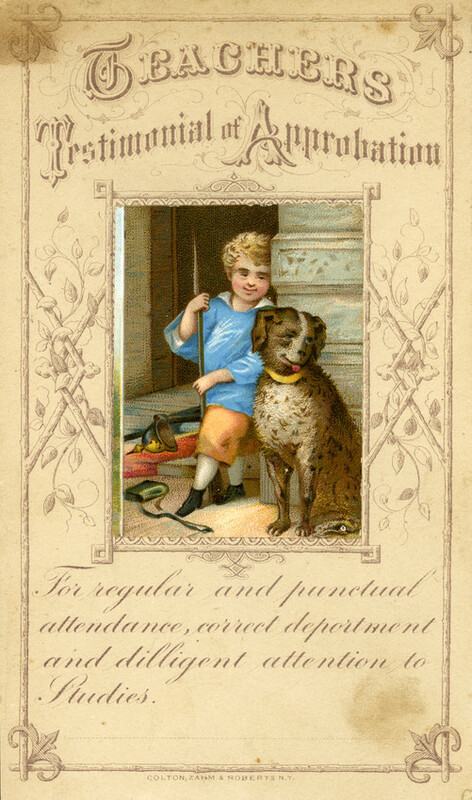 As Maurice Rickards points out in Encyclopedia of Ephemera, Reward-of-merit cards were a major sideline for the chromolithography industry; many commercial trade cards and personal calling card blanks required no greater adaption than the addition of the words 'Reward of Merit' in place of a name. The rewards of merit therefore reveal much about the printing industry, about its art, its audience, and its makers. Alongside progress in printing was progress in education, as attendance laws began to mandate that children attend school regularly. Now faced with larger classrooms, some teachers sought effective means to motivate their students without copious physical discipline. Rewards of merit were a useful and inexpensive option. Especially in the early decades of the nineteenth century, poor and Puritanical homes tended to be free of decoration, and for this reason the vivid drawings on rewards of merit were highly desirable to children. Rewards of merit were also apt vehicles for moral messages: many carry biblical verses which were meant to be memorized and recited, and others have religious messages such as Look to Jesus or Be kindly affectioned to one another. Some rewards depict children roaming through graveyards; a scene intended to nudge pupils into mentally preparing for an early death. These and others were used in American Sunday schools. In addition to bearing attractive pictures and moral messages, the reward of merit also functions as a receipt. It is proof that a student went to school for a time: something that made families proud. Perhaps this is why so many have survived for our examination. Fenn, P., & Malpa, A. P. (1994). Rewards of merit: Tokens of a child's progress and a teacher's esteem as an enduring aspect of American religious and secular education. Schoharie, NY: Ephemera Society of America. Hudson, G. S. (2008). The design & printing of ephemera in Britain & America, 1720-1920. London: British Library. Pierce, S., Slautterback, C., & Barnhill, G. B. (1997). Early American lithography: Images to 1830. Boston, MA: Boston Athenaeum. Rickards, M., Twyman, M., Beaumont, S. D., & Tanner, A. (2000). Reward of merit. In The encyclopedia of ephemera: A guide to the fragmentary documents of everyday life for the collector, curator, and historian (pp. 271-273). New York: Routledge. The materials in this collection had no original order and are arranged chronologically and by decade. Folders IX through XI contain miscellaneous items which require separate folders due to their size or condition.